My wife and I recently moved to rural northern Illinois (zone 5b), in a house we designed ourselves. What was once corn and soybean fields is now our front and back yards. Since moving in just two months ago, we have planted 21 trees, most of which are the beginning of a windbreak. The rest of our landscape is a barren. Of course we want to attract as many birds (and other wildlife) as possible and we are working with a blank slate so we have many options. Here are just eleven plants we plan on using as a starting point to add on to year after year. 1. 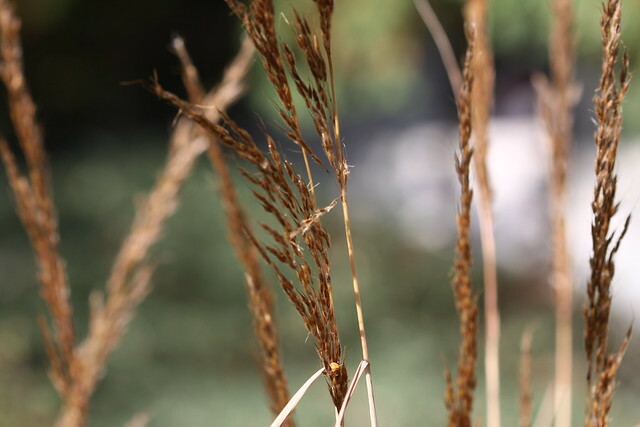 Big Bluestem - a tall native prairie grass that provides food and a lot of cover, especially good into the winter months. 2. Prairie Dropseed - a beautiful grass in its own right but also attracts birds. 3. Cupplant - attracts birds with their seeds and their leaves; the leaves form little cups that hold water and birds will come in for a drink. Cupplants can get a bit unruly and take over. They grow amazingly tall too! 4. Coneflower - there are many varieties but goldfinches and sparrows feast off the seed heads and butterflies love them too! 5. Arrowwood Viburnum (or other viburnums) - these shrubs produce berries that attract a ton of birds. I successfully planted one of these in my parent's yard. 6. 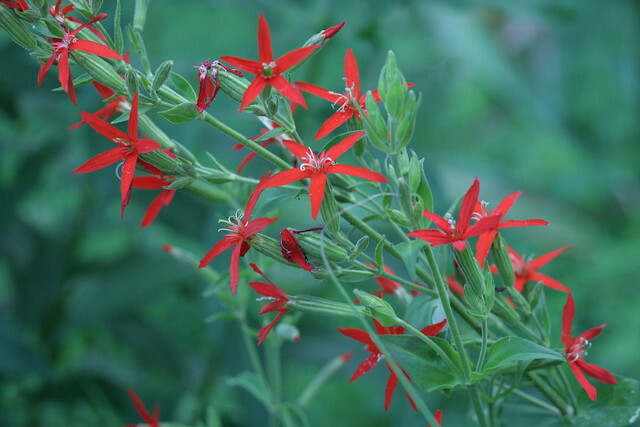 Royal Catchfly - a hummingbird magnet! I love these red beauties. 7. 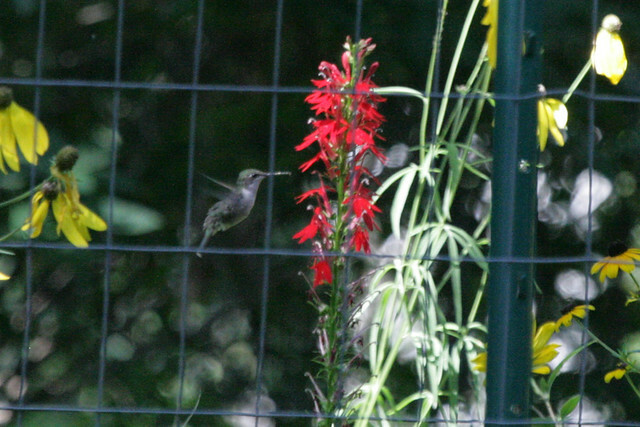 Cardinal Flower - another hummingbird favorite but one I had trouble getting to come back at my parent's house. The Ruby-throated Hummingbirds preferred feeding on the flowers over the feeders. 8. 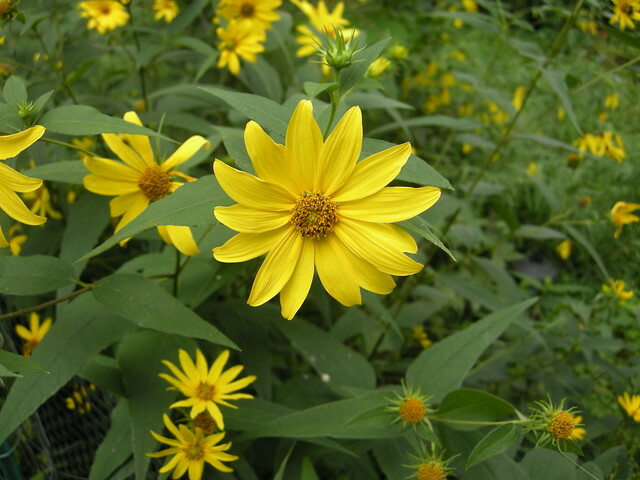 Woodland Sunflower - seed-eating birds love this native sunflower. 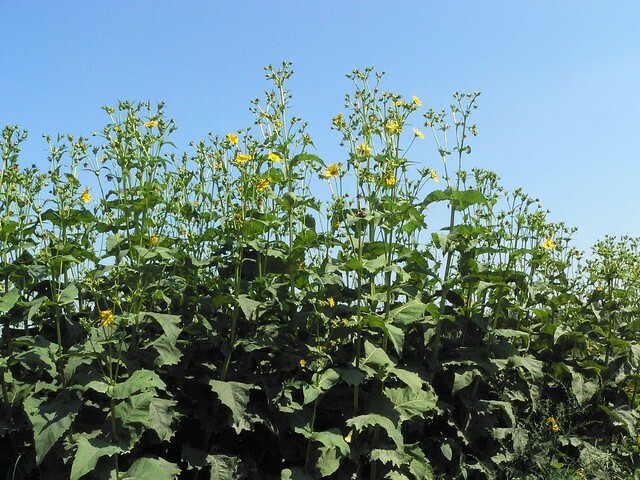 I also love other sunflowers, especially the ones that grow extra tall. 9. Blazingstar - there are several varieties that attract a lot of butterflies and other insects. 10. New Jersey Tea - birds love this plant! I've never used it but I've heard it is quite resilient and deer do not like it. 11. 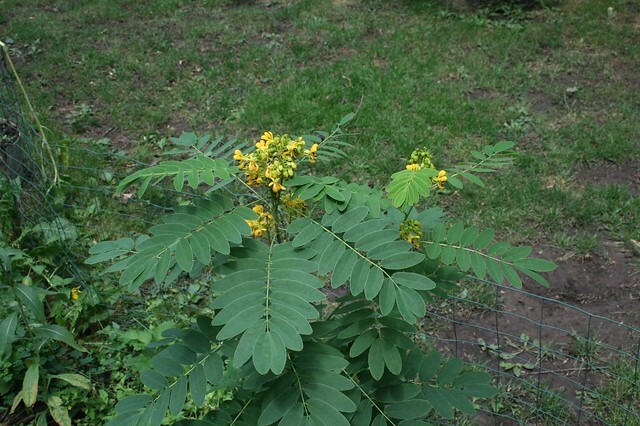 Wild Senna - a legume that birds love and is good for the soil. I'd love to hear suggestions on other great wildlife attracting plants! I live on some of the best soil in the world, an area that was once prairie. It is silt loam, the land is nearly flat and drains fairly well and we are in full sun. Note: We plan on moving our horse to our land, so there are quite a few plants we must avoid, including anything in the milkweed family. You've got a good start there. My cupplants bring in flocks of goldfinches every autumn! (And you're right, they are prolific and can take over.) I'm in Minneapolis, so a little more north of you and I had a hard time getting New Jersey Tea to grow in my sandy soil, so as long as yours retains moisture, you should be OK. Beware of rabbits! They love the young New Jersey Tea plants, but seem to leave them alone once the plant gets more established. I'd also look into additional grasses to flesh out your prairie (like side-oats grama, for example), and then some later-flowering plants like native asters. The additional diversity and extended flowering will help make sure the birds and other wildlife have plenty to eat over the course of the seasons. Another vote for asters - the bees love them in late August, September, even early October in Western Wisconsin. Serviceberry and Juneberry shrubs add structure and the robins/waxwings will line up waiting to grab the berries. We've had great results with Swamp Milkweed, Butterfly Weed, and even Whorled Milkweed for Monarch Butterflies. Also throw in some Baptisia, Wild Bergamot (Beebalm), and Lupine (try to get varieties of Lupine native to your area, since the timing of lupine blooms are fairly region-specific). Pasque flowers add some great early-spring color and give the insects something to do early in the year. Peter - wonderful advice! I definitely want to do more prairie grasses; I am hoping to start small and eventually have a prairie of an acre or more. We are pretty rabbit free; raccoons and skunks mostly. Matt - I like asters and lupine would be great. Thanks for the other suggestions as well! I have to pass on the milkweed and butterfly weed because they are bad for horses and although ours won't be too close, I would rather not risk it. But they are great wildlife attractors! Great post! I love when people discover the value of native plants. 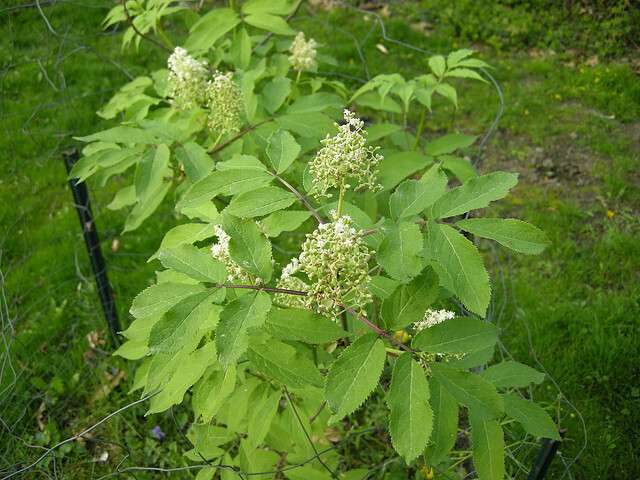 One nit-picky thing though: The Arrowwood Viburnum picture is actually of Red Elderberry. And the trick to Cardinalflower is that they're biennial (meaning they only live about 2-3 years) and the seed (each seed pod produces hundreds of tiny seeds) needs disturbance to germinate. So just scratch up the soil in the late fall and early spring. Other plants I recommend are Baptisia sp. (false indigo), Asclepias sp. (milkweed), goldenrods, and asters. All are great for pollinators and are required host plants for many insect larva (great food for birds). I'm so jealous. I dream of creating my own bird friendly yard. I think BT3 recommends gray birch for attracting insects and birds, so you might see if they grow where you are. In my area southwestern Idaho native plants like golden currant, lupine, columbine, agastachi, penstemon, and wild sunflower are big attractors of birds. How about Pokeweed and Mulberry? Butterfly Bush and Butterfly Weed? Gardnie07 - oops! I thought that was where I had planted an Arrowwood in my parent's yard (that was what I wanted there at least) and have always thought that was what it was without another thought! 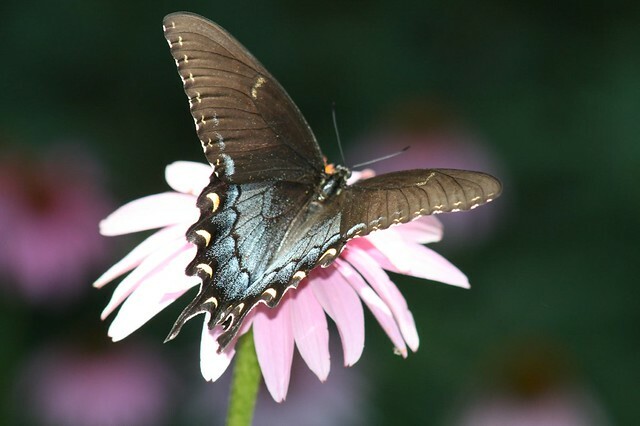 I'll try that with the Cardinal Flower. Thanks for the other suggestions too! Robert - my parent's have columbine and it looks great but I think their dogs may have ruined some of them; I will have to try gray birch; thanks! Bpadgett - thanks for the suggestions; pokeweed and mulberry would be especially good! You are going to have so many birds!! And, a beautiful yard.